Community Sanitation and Recycling Organization (CSARO) is a Cambodian non-governmental organization (NGO). It was established in February 1997 by a group of development workers committed to improving the environment and living conditions of the urban poor in Cambodia. CSARO is a leader in the use of participatory models to improve conditions in the areas where the urban poor live which are oft en unplanned and un-serviced parts of the city. A special focus of CSARO’s work is improving the living and working conditions of the thousands of adult and child waste pickers who make their living by sorting through rubbish on the street and from piles of garbage. Urban communities where residents and waste pickers work together to transform slum areas into clean, safe and healthy places to live, and where waste pickers work together to improve their social and economic conditions. To encourage and motivate urban poor people to improve their capacity and their environmental, social and economic conditions. The empowered of urban communities and waste pickers, cooperating to improve their environment and creating better family economic condition for sustainable future. Objective1: Empowered urban communities capable of handing their own development and the creation of a clean and healthy environment in a sustainable manner. Improved economic and social condition of target waste picker. Objective2: Empowered Self-Help Groups working with target communities to implement a solid waste management system in a sustainable manner. Objective3: Assist waste pickers to better their social and economic conditions through skills development and self-help activities. Improve communities’ capacity to develop for a sustainable future. Phnom Penh City, the capital of the Kingdom of Cambodia, is located at the meeting of three rivers, the Mekong, the Tonle Sap and the Bassac. The city has a population in excess of 1 million (including a large number of seasonal migrants) and an area of 290 Km2. Administratively, it is divided into 7 districts, 3 being predominately rural or peri-urban and 4 constituting the built-up urban core. Population densities are as high as 43,696 per km2. 17.6% of families live in informal settlements, 35% of families lack piped water supply and only 51% of the population has finished primary school. Since 1998, CSARO has been implementing its Neighborhood Improvement Program (NIP) in Chamcarmon District in the south of the city. This district has a population of 200,000+ and is divided into 12 Sangkats (Wards). CSARO has focused it's Community Development and Environmental Hygiene Awareness program on 6 of these Sangkats (light shaded area) with 68,095 residents. The area includes 10 primary schools, 3 middle schools and 1 high school with a total student population of 29,792. Within this area, the Solid Waste Management program operates a pilot zone containing more than 2000 households (darker shaded area). In addition to the NIP, the Mobile Outreach Team program of "curb side classrooms" has set-up 9 day-time and 4 night-time contact points in 4 of the city's districts (indicated with light and dark stars respectively). CSARO's Waste Picker Development Center services the needs of informal sector workers from throughout the city. CSARO expanded Community Development and Environmental Hygiene Awareness coverage to 6 additional communes. The Solid Waste Management program expanded to cover more than 6000 households and the Mobile Outreach Education program increased coverage into two additional districts. The activities of the Solid Waste Management program were stopped in September 2004 due to changes in government policy. In 2006, CSARO purchased land for the construction of a new recycling and composting center in Khmunh Commune, Roussey Keo District. CSARO will close the existing waste recycling center and the new center will be active in the near future. Solid waste collection services were started in one new area in Samaki Community, Trapeang Krasang Commune, Dong Kao District, and planning is underway for waste collection services in two new areas in Anlongkrangan Community, Khmunh Commune, Roussey Keo District, and Toul Rokakos Community, Prey Sor Commune, Dong Kao District. In 2005, the Community Development Program established four new CDCs, and plans to expand activities to communities in five new districts in Phnom Penh City. In 2005, the Mobile Outreach Education program adjusted outreach locations to better suit the needs of the target groups. The generation of a comprehensive profile of those active in waste picking. An assessment of the market potential for recyclable material. 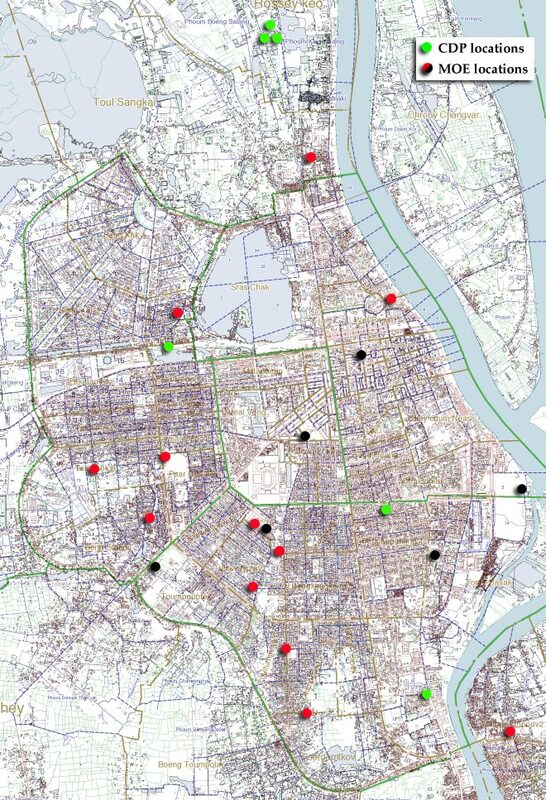 An identification of the ability to undertake income generation activities based around recycled materials in Phnom Penh. The identification of potential areas to assist in establishing pilot programmes for social and economic development of waste pickers. Phnom Penh is a city facing many problems, from rapid population growth to inadequate and dilapidated infrastructure and services. One of the main problems facing the city and its authorities is the growing problem of solid waste management. Ever greater volumes of waste are being generated by the city's population and due to existing inefficiencies in the waste management system (under financing, weak management capacity) this waste is often thrown on roadsides, vacant land and into drainage canals within the city. This creates further public health and environmental problems for the city and its residents. In addition the existing land fill site at Stung Mean Chey has reached the end of its operable life. New locations are being examined for future development, but may be some years in coming. However, within the city one group of the city's urban poor makes their daily income from the waste left around the city. These waste pickers sort through the garbage and collect recyclable materials, which they can then sell to depots throughout the city. The waste pickers are highly visible as they push their handcarts around the city and are often heard calling "Hychai". Until now, little was known about their activities, or economic and living conditions. In an attempt to gain more knowledge about their living conditions and livelihood that a survey of waste pickers was undertaken, the analysis of the resulting analysis are the basis for this report. 51% of waste pickers active in Phnom Penh are children (less than 18 years of age), while 35% are aged under 15 years of age. Ages of those surveyed ranged from 8 years to 77 years. The majority of waste pickers are male (62%). This anomaly is primarily due the fact that girls and women often take up domestic responsibilities within households at a young age and a large number of waste pickers are children. In addition to this young girls and women are perceived to be more in danger from assault and kidnapping. Most waste pickers come from "large households of greater than 5 members, the average waste picker household has 5.42 persons. 34% of the waste picker households are female-headed households. Of those people active in waste picking the vast majority are ethnically Khmer 68%, while 26% are ethnically Vietnamese. Most waste pickers stated that they have attended some form of educational institution (schools or pagodas) to learn to read and write. However the levels of literacy are just below the estimated national averages (65%) but well below the estimated urban averages (78%). Many of the children claim to attend school but 68% are working 7 hours or more per day, out of economic necessity for their families. 88% of waste pickers are unpaid family members working to contribute to household incomes. 73% of waste pickers, including children, work more than 7 hours per day. Over half walk more than 10 km per day while they work. Over 90% of waste pickers have little or no clothing to protect against injury or infections. 40% of all waste pickers are regularly threatened and harassed. This figure increases for children to over 60%. A third of all female waste pickers are regularly threatened. The majority of those active in waste picking (63.9%) are earning less than 3000 Riels ($0.75) per day. While 95% of them are earning less than 5,000R ($1.25) per day. Most waste picker families (74%) have to survive on less than $50 per month. When one considers that the average household size is 5.42 persons, this gives less than $10 monthly per capita to survive. A recent World Bank Study has attempted to set the poverty line for Phnom Penh at approximately $111 per month per family. About one third of waste pickers borrow money to purchase more valuable waste materials usually from households. One interesting fact was that 50% of female waste pickers borrowed money, while only a third of male waste pickers did. However, borrowing does not appear to significantly increase their daily earning potential, most are still earning only 3,000 - 5,000 Riels per day. Over 80% of waste pickers have suffered some form of illness or injury within the previous month. Most waste pickers (61%) treated themselves with medicines when ill. Only 1% attempted to see a doctor. The majority of waste picker households (81%) live in single room dwellings. Most of these are made from either palm leaf (46%) or wood (46%). Less than 2% of waste picker households live in houses constructed of more durable materials such as brick. 64% of waste picker household have to purchase water from vendors. Only 2.6% have access to piped water. Additionally 61% of waste picker households do not have any access to basic toilet facilities. Most households (72%) use wood for fuel and over half do not have access to electricity. The most frequently collected waste materials are "aluminium cans", "plastic water bottles", "glass bottles", and "cardboard and paper". The average purchasing price by waste pickers for these items were; cans 25 Riel ($0.008); plastic bottle 327 Riels ($0.10); various glass bottles 100 Riels ($0.03) and cardboard & paper at 73 Riels ($0.02). The most valuable items to waste pickers were car batteries, copper, and fans. While the average selling prices to depots were; cans 31 Riels ($0.01); plastic bottles 489 Riels ($0.15). Glass bottles 110 Riels ($0.035) and cardboard and paper at 110 Riels ($0.035). The profit margins are very low, requiring large volumes of materials to earn a days income. Prices paid by various depots within the survey area varied greatly for materials. Improve access to education, particularly for children, utilizing both formal and informal approaches. For older children and adults, vocational skills training needs to be made more accessible. This will allow them to improve their earning potential, so as to better look after themselves and their families and by doing so reduce the burden on children, preventing them from working long hours to contribute to household incomes. Improve personal awareness of hygiene and health issues, particularly the dangers of self-treatment. Allow for the provision of appropriate protective clothing; increase their understanding and use of available medical services within the city. Provide centers to allow waste pickers the opportunity to adequately clean themselves, reducing the risk of self-contamination from disease regularly associated with waste and a polluted environment. Develop appropriate small scale infrastructure and servicing projects, particularly for water supply and sanitation within urban poor communities where waste pickers reside. This will often depend on improving security of tenure of waste picker households. Develop more suitable forms of housing finance to provide the ability to improve their housing conditions. Develop public awareness of the hazards that illegal dumping of waste poses both to themselves and other citizens within the city. Integrate the waste pickers into the formal SWM system, utilizing them to collect waste from unserviced and inaccessible areas. Promote more community-based responsibility for solid waste management and the benefits from environmental improvement. Encourage domestic sorting of waste into "wet" (organic) and "dry" (non-organic) streams. Then collect these wastes at the same time, and utilize the wet matter for composting purposes, initially for volume reduction of waste, but if the market potential exists for use as an organic fertilizers. Dry matter can be post sorted into recyclable materials and matter that should be removed to the landfill. This should further reduce the volumes of waste going to landfill sites. 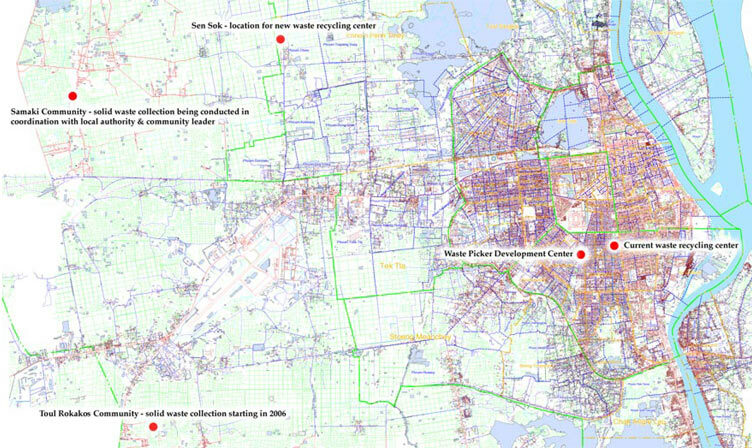 Further investigation is required into the development of uses for recycled materials within Phnom Penh. Develop a number of multi-use centers for waste pickers, initially operating as contact points for waste pickers and their families. Once confidence has been built, various activities will be undertaken providing locations for both social development activities and community based environmental improvements. The social development activities could require informal education and hygiene awareness building. While the environmental improvements could require micro-scale composting of "wet" waste, and post sorting and preliminary processing of recyclable waste with the profits going directly to waste pickers. This will result in volume reduction of wastes destined for landfills. The location could also be utilized for short-term storage of materials, requiring the provision of appropriate containers. Cleansing facilities could also be provided allowing waste pickers the opportunity to properly clean, particularly prior to eating. This would reduce the high incidence of self-contamination. The centers could also provide locations for informal child care: young children could be left in safety, free the adults from having to carry infants and young children while working, and also removing these infants and children from exposure to pathogens and disease. Initially incentives would probably have to be used, until waste pickers felt confident about the role and purpose of the centers. Some of the possible incentives could require access to showers and cleaning facilities, possible purchasing of materials collected at market values but purchased with a non profit motive, and access to a doctor on a regular basis, allowing waste pickers to get correct and proper diagnosis of frequent illness. The various activities that could be integrated into the centers would face some conflict between emphasis on social and economic improvements, and environmental improvement activities. This would allow for more efficient removal of waste, reduced volumes of waste being transported to the landfill, and greater sustainability through recycling of materials. Environmental activities would probably be easier and quicker to instigate, but social improvement activities would probably have a greater impact over time. The difficulty will be in finding the balance between the two types of activities.